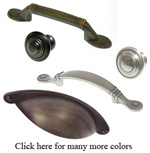 Below are all the different cabinet hardware items we offer. Cabinet handles in many colors, sizes and price ranges. Kitchen knobs and cabinet pulls are also shown. Accessories for your cabinets and kitchens can be found on our site. Cabinet Hardware for kitchens, cupboards, vanities and bath will enhance any woodworkers long hours of work. If you are unsure of what you want in new cabinet hardware handles and knobs then may we suggest you click on the Handles and Knobs Complete Line above. There you will see all the handles and cabinet hardware we have. Spend some time as it is very easy to scroll down through the items and go to the next page.